The auditor becomes familiar with the taxpayer's account during the pre-audit research phase of the audit process. The auditor should review certain information about the account and the business to be audited before the taxpayer is contacted. Then, the auditor performs additional research through taxpayer contact and preliminary testing. Agency Work Manager monitors the current status and location of an audit assignment. The system also provides management reports compiled from data entered to the system by field offices and Headquarters. When assigned to a partnership or corporation, The next nine digits are the taxpayer's Federal Employer Identification number (FEI #). The last digit is a self-checking number. When assigned to a sole proprietor. The next nine digits are randomly assigned by the computer system. Certificate of No Tax Due (NTD) request. The Audit Questionnaire and the Notice of Routine Audit Letter are mailed to the taxpayer when an audit is generated or assigned in the local audit office. The properly completed questionnaire provides information on the taxpayer's authorized representatives, business activity and the taxpayer's computer system. The questionnaire needs to be signed by someone who has the authority to enter into contracts on behalf of the taxpayer. This will usually be a corporate officer/director, partner, or owner of the business. The auditor should mail the questionnaire and letter to the taxpayer if they have not been mailed when the audit assignment file is received. Within two weeks from the time the completed questionnaire is received, the auditor should contact the taxpayer. NOTE: After the initial contact, if an appointment is not set within 45 days, a written follow up is required and every 45 days thereafter until an appointment is set. If the completed questionnaire is not returned within 30 days, the taxpayer should be called and if applicable, a second questionnaire sent by certified mail. If the questionnaire is not returned prior to the scheduled appointment date, it should be completed by the taxpayer during the entrance conference. If the taxpayer or taxpayer contact refuses to sign or initial the questionnaire (or contact could never be made with the taxpayer), the form should be completed by the auditor and 'taxpayer refused/unable to sign' and name of the refusing party should be noted on the signature line of the form. A copy of the completed Audit Questionnaire is included in the audit package as an attachment to the audit plan. If during the audit, pertinent information on the questionnaire changes (i.e., entity name, company merger, etc. ), the questionnaire should be updated. Any superseded questionnaires should be saved and placed behind the most current questionnaire in the audit package as this provides proof that certain information was correct at certain points during the audit process. For example, the audit package may contain a statute waiver document signed by an individual who was authorized at a certain point in time but who may no longer be employed by the taxpayer. An exhibit of the Audit Questionnaire is shown on the following pages. This section will address special situations regarding Audit Questionnaires that do not fall within the above guidelines. Inquiry - Utilize the Agency data base to determine if there are addresses for the owner or officers of the entity or if there are different business addresses listed for other taxes for which the taxpayer is responsible. Enforcement Office - Contact the appropriate enforcement office to determine if an assignment has been generated on the taxpayer and additional information obtained. Post Office - After the forwarding request has expired, the post office will still have the forwarding address for the taxpayer on file. Utility Companies - Contact the gas, electric and telephone companies to determine if the taxpayer had services transferred to a different location. Neighboring businesses - Interview individuals at locations in relatively close proximity to the taxpayer to determine if they can furnish any information helpful in locating the taxpayer. Landlord - Determine if the prior landlord has a current address or any other information on the taxpayer. If the auditor is unable to reach the taxpayer by telephone (i.e., taxpayer fails to return the auditor's calls) and the second questionnaire is not returned, the auditor should visit in person the taxpayer's place of business or location, complete the questionnaire, and request to examine business records. If the records are not made available for examination, the auditor should reference the section of the statute that authorizes the Comptroller to examine a taxpayer's records. All contact with the taxpayer should be documented in the audit plan if there are indications of problems with obtaining the records. If the taxpayer cannot be located in person or refuses to make necessary business records available for audit, a letter should be sent by certified mail stating the taxpayer has not responded to repeated attempts to conduct an audit of the business records. The letter should reference the section of the statute that authorizes the Comptroller to examine a taxpayer's records and document attempts to contact the taxpayer. See AP 70. A copy of this certified letter is included in the following pages. If the taxpayer does not respond to the first certified letter within 30 days, a second letter, sent certified, return receipt requested, will be sent by the supervisor/audit manager requesting the necessary records. This second letter will mention that a subpoena will be issued for the records if there is no response within 14 days. See AP 70. A copy of this second letter is included in the following pages. Once the auditor has completed the Request for Subpoena of Records form, it must be e-mailed to the Supervisor or Manager who will then email it to the General Counsel. A courtesy copy of the e-mail should be sent to the Assistant Manager of Audit Division. The General Counsel will issue the subpoena and forward it back to the auditor. The auditor can serve the subpoena or request assistance from the CID Investigators. If the taxpayer still does not respond to the numerous requests, the auditor should estimate the audit liability. The estimate should have a valid basis and assess tax for the correct audit period. The 'Alternate Auditing Methods' section of Chapter 5 contains details and specific audit procedures that may be used when the taxpayer's records are not available. This section of the manual should be used in addition to the information that follows in estimating a deficiency. Customer's Records - If a large percentage of the taxpayer's business activity is with a small number of customers, the customers may be contacted to provide sales invoices from the taxpayer under audit. Texas Employment Commission Records - Returns filed with the Texas Employment Commission may be requested to determine the period for which the taxpayer filed employment returns. Utility Company Records - The 'service record' will provide the time frame within which the taxpayer's business was operating. Landlord - The taxpayer's landlord may provide a lease agreement and information relative to the business activity during the lease period. Interviews with neighboring businesses/tenants - These individuals can provide information relative to the period in which the taxpayer operated at a given location. Court - If the records are being held by a court because of a bankruptcy, liquidation, or pending liquidation of the company, a Legal Services Division attorney can petition the court to have the records made available for the auditor's examination. In the absence of verifiable documentation, disallow the reported deductions and assess tax on the reported 'Total Sales' amount. Contact the Internal Revenue Service in order to obtain sales amounts reported on Federal Income Tax returns. Audit Division encourages the use of Computer Audit Menu System (CAMS) and CAMS-PC to increase audit efficiency. Even many smaller companies utilize computers to maintain their records. Both CAMS and CAMS-PC enable the auditor to identify and then extract those records determined to be necessary for the examination. Although it may seem that much time is spent of the planning phase of a computer assisted audit, the main benefits include the refinement of the audit scope and the promotion of sound and efficient sampling techniques. To this end, it is important to look at possible computer use during pre-audit work. Auditor judgment, the availability of detail computerized records, and the specific audit situation dictate computer assisted audit usage. The auditor needs to identify, as quickly as possible, the need for a computer assisted audit and then notify the Computer Audit Information & Support section of Audit Headquarters so that a Computer Audit Specialist may be assigned for future assistance. The history is a computer-generated summary of all transactions relating to a particular tax account. Each sales tax return filed becomes a part of the sales tax history. The audit file should contain a history if the tax is on the mainframe computer system. The 'Audit Sales Tax History' provides detailed information for each outlet and a summary of reported information for all outlets. This history was designed especially for Audit Division, gives only final amounts reported by the taxpayer and is available one day after request. The auditor should be certain that the history is current in order to have the latest updated information. If the history in the file does not cover all audit periods, the XIPMTS (data payment) inquiry can be used to update the history. The following numbered information relates to Exhibit V and Exhibit VI. This is the date the history was generated and may indicate an old history that necessitates update with XIPMTS function. An old history is one that does not contain all audit periods. Taxpayer information. Taxpayer name and address should be the same on Agency Work Manager, MTSUMM, and history. If in management halt, the auditor should find out why before proceeding with the audit. If the history is old and is updated by XIDATA or XIPMTS inquiries, then the XTCOLL inquiry should be run to ensure there are no open collection records. If there are open collection records, the auditor will need to address them during the audit. Also run XIXREF AND XIREFS inquiries to check on the status of any refund claims. This is the period covered by the history. If a prior audit exists, the Work Manager information entered for that audit will appear here. Two entries for the same audit will reflect an audit being amended. The first entry will be the original audit and the second entry will be the amended audit. The auditor will note the periods covered by prior audit as these periods are closed out regardless of statute. The error codes listed are the two largest errors noted in the prior audit. The auditor may use the hours spent on the prior audit in budgeting time or in better understanding of either the complexities involved in the audit, or the thoroughness of the prior audit. Coding for city, county/ Special Purpose District (SPD) and Metropolitan Transit Authority (MTA)/ City Transit Department (CTD) taxes appears as well as the way the taxpayer files. Review the outlet/city, outlet/county, and outlet/MTA indicators. They may indicate if city, county/SPD, and/or MTA/CTD taxes are to be included in the examination, but this should be verified in the audit. For example, an outlet may be in an area which was annexed into a city/MTA at some point during the audit period, so there may be a change of date to be considered. The city, county/SPD, and/or MTA/CTD reporting method should also be examined to determine if the taxpayer reports by outlet or by city, county/SPD, and/or MTA/CTD list. The reporting method may affect procedures used when comparing returns with records. The auditor should verify that all known sales outlets appear on the history. If an outlet is opened during the audit period, the auditor should pay close attention to any sales prior to the outlet start date and how they were handled. In addition, there may be problems upon the start of an outlet with record keeping, charging the correct tax rate or taxability questions. If sales occur before the start date of an outlet, file maintenance is needed to change the outlet start date. If purchases occur before a start date, no file maintenance is necessary. The business description listed should be compared to the business description on the questionnaire for possible file maintenance. This description is useful in determining the area of law or industry that may require pre-audit research. If an outlet goes out of business (OOB) during the audit period, an auditor may need to look for asset sales. If an outlet goes out of business prior to the first period of the audit, this outlet may be disregarded; however, this needs to be verified with the taxpayer's records. The Report Information section (9) will list any 'Estimated Returns,' 'Non-Filer Returns,' 'Late Returns,' 'Valid Judgment Periods,' or 'Valid Certification Periods' during the requested period. An 'X' will appear in the applicable period and category. XIDATA or XIPMTS inquiries should be run to ensure that there were not any amended returns during the period. The DUEDAY inquiry can be used to determine the correct due date for a report period. Returns should be considered late even if no amounts subject to taxes were reported ('zero returns'). The Data Information by Outlet will be listed by period for each outlet that was active within the audit period. The following numbered information relates to Exhibit IV. Postmark date should be verified by running the XIDATA and XIPMTS inquiries. Total (gross) sales reported may actually be taxable sales. Total sales reported on the return appear as Gross Sales on the history. The taxpayer does not report deductions or percentage of deductions. These amounts are generated by the computer based upon the total sales and taxable sales reported by the taxpayer. If there are no deductions, it may indicate that the gross sales figure is a netted amount or an amount computed from taxes collected. Total taxable sales as reported by the taxpayer. If there are no taxable purchases reported, examine the taxpayer's records to verify that there were none or that these purchases were included in the netted gross sales figure (rare occurrence). City, MTA/CTD and county amounts subject to tax include all reported amounts by outlet. If the taxpayer reports by list for this outlet, the amount will not appear here. It will appear in the 'Tax Reported by City' or 'MTA/CTD List' section of the history. IMPORTANT: The auditor should examine all reported amounts for any fluctuations which appear to be unusual. These fluctuations may indicate a change in personnel, accounting procedures, or internal control. These fluctuations need to be considered when choosing periods for preliminary testing or sampling. In several industries, there are expected swings in reporting that the auditor will make allowances for; i.e., retail establishments may have large Christmas or holiday sales followed by very low periods where credit for returns is being allowed. This section includes data reported by city, MTA/CTD and county reported by list rather than outlet. These amounts are reported in addition to any amounts reported in the Outlet Return Data section. The authority code/name/amount subject to tax and total tax per period and authority are listed. They are listed in numeric city, MTA, CTD and County code order. This report is in the same format as the Outlet Return Data. It summarizes all outlets and list information. The auditor should compare the amounts reported for state, city, MTA/CTD, SPD, and county subject to tax per report period. If the amounts differ between these tax types, significant differences should be noted and reconciled. Differences may occur if some outlets are not within a taxing jurisdiction or if outlet location and shipping/delivery destination are not the same. The summary also reports all tax reported per period. This amount is useful in completing the tax reported field on the percentage of error section of the Penalty and Interest Waiver Worksheet. This report lists the postmark dates and types of payments made during each period. This section of the Audit History lists any collection activity for the taxpayer during the requested period. This part of the sales tax history will print if the taxpayer has filed any refund claims. The claims are listed by date and uniqueness number (the uniqueness number is unique by day, meaning that if the taxpayer filed three claims and those claims were processed on the same day, the uniqueness numbers would be one, two and three). The DLN number will always be different. Also listed is the amount of the claim(s) and the amount refunded, if any. All paid claims falling within the audit period must be verified. The 'Claim Paid' date, not the period in question, determines if the refund claim is in the audit period. See the following example. There is a great deal of information available to the auditor through terminal inquiry. The information used in an audit is not limited to the account being audited. Inquiries are made to obtain information on related entities, customers and vendors. This section will also reference some useful inquiries used in audit as well as pre-audit activities. STS Quick Reference Guide - A list of available codes, descriptions and entry formats. In addition, some CICS inquiries have been developed to aid in use of the terminal. The following is a list of some commonly used inquiry codes and some of their uses. Used to find taxpayer numbers when you only have the name. Other inquiries use the taxpayer number instead of taxpayer name. A cross reference between sole owners and partnerships. Also used in tracing entity type changes. Gives all partners within a partnership. Will display information on tax exempt organizations after entering the name of the organization - useful in verifying non-taxed sales/deleting obvious exemptions. Will show if a taxpayer has been audited or if an audit is in progress. Gives more information than history audit section. Useful in checking if an entity has been audited prior to setting up audit lead, or verifying that amounts were set up in another audit. The AFCONT screen can also be accessed through this inquiry. This screen shows audit contact for prior audits. Gives all open collection records (option 1). The auditor should be aware of any open collection records within the audit period, prior to starting the audit. The taxpayer should be notified that he has open collection records and the auditor must verify if they are valid. Invalid records must be closed prior to submitting an audit. If an open collection record is due to a non-filer period, the return must be filed and the record closed prior to sending the audit to the Regional Processing Center (RPC). Can be accessed through the XICOLL function by entering an 'X' beside a record. Useful for tracing payments to open collection records, particularly audit records, collection activity, and billing information. This gives reported payment amounts for all sales and use taxes broken down by period and allocation (state or local), transfers in or out, and refunds. Gives reported amounts for all system taxes broken down by period and outlet or list. examine reported sales or purchases of entities claiming resale exemption or payment through returns. that 'audit period' appears in the upper right if an audit has been completed that includes the period on the screen. that the return type is noted as a regular, amended or manual estimate (filed by enforcement) return. This is one of several bankruptcy screens available for inquiry. This screen displays case related information such as case ID, bankrupt ID, chapter type, petition date, file by date, and confirmation date. Note: The case ID is the bankruptcy number assigned to the case by the court, and the bankrupt ID is the taxpayer number or social security number of the entity that filed. To access this screen, enter the TCode followed by a '1,' and the taxpayer number, or the TCode followed by a '2' and the case ID (i.e., LISUMM.1.12345678903 or LISUMM.2.9130246.). This bankruptcy screen lists all bankruptcy cases associated with a specific ID (taxpayer number or partner ID). This screen also indicates whether the ID entered is set up as bankrupt on the taxpayer database. This bankruptcy screen lists all taxpayers associated with a specific case number. This bankruptcy screen lists the attorney or trustee associated with the case. This is the bankruptcy system main menu. Most of the TCodes mentioned above can be accessed through this screen by entering an 'x' on the appropriate line and either the case ID or the taxpayer number (bankrupt ID) in the appropriate field.If the taxpayer is in bankruptcy but there is no bankruptcy screen information, contact the Bankruptcy Section of Revenue Accounting. The Bankruptcy Section of Revenue Accounting needs tax due figures of bankruptcy audits at least 10 working days before the file by date as indicated on LISUMM. Tax estimates will be accepted if the audit cannot be completed by this date. Notify the Bankruptcy Section via SYSM (user ID is RABNKR) with as accurate an estimate as possible. The tax should be broken down by jurisdiction (state, city, MTA/CTD, County/SPD) before and after the bankruptcy date. Notify the Bankruptcy Section if significant changes to the estimate are known before the confirmation date. If the audit is completed within one month of the file by date, notify the Bankruptcy Section of Revenue Accounting via SYSM of the tax due and that the audit is being sent to the RPC. Audits of taxpayers in bankruptcy status should be sent to the RPC with an expedite handling flag attached. Gives information for all automated taxes administered by the agency for which the taxpayer is liable. Gives a phone number for contact and open collection record, non-filer and hot check counts. Also tells if the taxpayer is in bankruptcy or management halt and what enforcement office and enforcement officer (if any) is working the account. This multi-tax inquiry briefly summarizes all taxes for which the taxpayer has been permitted. The advantage over MTSUMM is that all the taxes are listed on one or two screens instead of paging through numerous screens to investigate all the permitted tax types. This inquiry may also include limited information on the status of the permit or the last report filed by the taxpayer. A=active outlets, B=both inactive & active outlets. The outlet information includes permit dates, allocation codings, first taxable sale dates, and NAICS codes. It is useful in updating histories when a new outlet has been added and in verifying resale certificates by knowing the NAICS code of the taxpayer. Shows the amount of the refund claim, the amount paid and/or denied, and the status of the claim. The reference number on this inquiry is the same as the Document Locator Number (DLN) shown on the refund history. Shows the total number of refund claims filed under the taxpayer number. Shows the date paid and amount of payment, by claim. Shows the physical location for each outlet that is set up with a Texas address. Out-of-state locations may be listed as information only, but not necessarily for tax responsibility. TCODE.PAYEE #.TAX TYPE.JULIAN DATE.UNIQUENESS #. NOTE: Information above shown in italics indicates an optional field. The cards should be filled out as completely as possible. In some cases, it may be necessary to attach copies of contracts, certificates, audit schedules, newspaper articles, or other pertinent data. See Exhibit XIV for example. The auditor should pay particular attention to whether the items listed on the reverse side of the form were included in the audit where the transaction was seen. Upon completion of the audit, the results should be relayed to the initiating office. This response may be written on a copy of the original account information card or in the form of a memo. The original account information card should remain with the audit file in the auditor's work papers. This card will not be imaged — needs to be placed inside the audit folder upon submission to the Euless Processing Center. The auditor can determine if there has been a prior audit by checking the audit history. Additional information can be obtained by running the Work Manager terminal inquiry and by looking in MidClient (Imaging System). Note the prior audit period to avoid re-auditing the same report periods. Look for errors and exceptions noted in the prior audit and discuss them with the taxpayer to determine if corrective action has been taken. Note even if corrections were made. Often there is a period early in the current audit, prior to the change, where adjustments are necessary. If the taxpayer disagreed with the audit, follow the audit through the hearings process to see how hearings decisions affect the audit. A prior audit should not serve as a blueprint for the current audit. Changes in tax law and business operations occurring since prior audits are important areas to cover. The prior audit can be used to enhance the current auditor's use of time by identifying records examined, the difficulties of certain audit methods and areas where no errors were found that may require less emphasis in the current audit. An auditor can view copies of prior audits (if not in office inventory) on MidClient. Through examination of the history, audit questionnaire and other information in the audit file, the auditor will have an idea of the type of business or industry being audited. Each office has copies of the tax statutes and rules. The auditor also has access to the statutes and rules at the Comptroller Web site (@CPA) via the internet. The auditor should place copies of the rules concerning the taxpayer's type of business in the audit file for reference and for distribution to the taxpayer. NOTE: The effective date and date filed with the Secretary of State posted at the end of each ruling have no bearing on the date for which the law was applicable. Consult your training manuals concerning taxability for actual effective dates. In addition, a Comptroller employee may choose to view the Open Records (edited documents). The Open Records collection has been edited for confidential information. The Open Records documents may be accessed by the general public via the Comptroller's website. 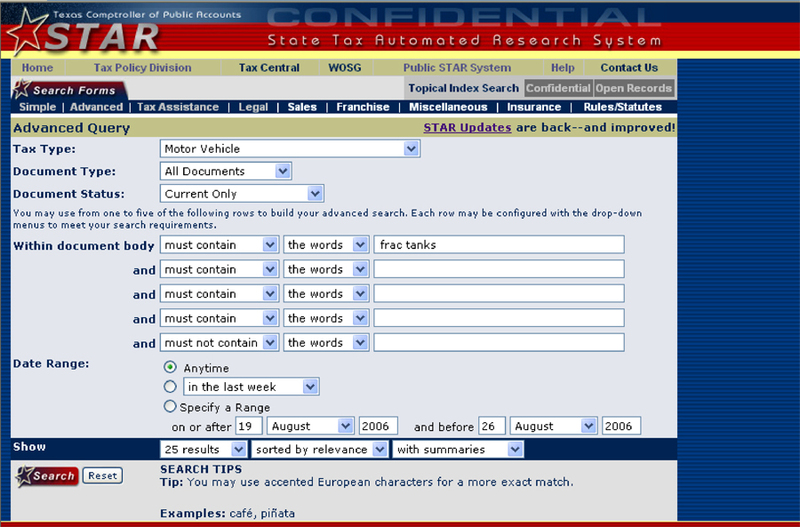 A user can access documents using simple word and filter searches ('Simple' Search Form) or by way of a subject matter index ('Advanced' Search Form). For an explanation of these search forms, refer to the online 'STAR Users Guide' by clicking on 'Help' while on the STAR System. A brief overview of the Star System follows. Status refers to whether or not a document is superseded. Each document retrieved contains a field for 'Y,' meaning a document is superseded or 'N,' meaning that a document is not superseded. A superseded document does not represent current policy. The database will be searched by the tax type selected. One of the possible selections is 'ALL Taxes.' Consult the online 'Star Users Guide' for the possible tax type selections. Each document retrieved contains a field for tax types at the bottom of the document. The default setting is 'Anytime' meaning that the system would search all documents which meet the selected criteria, regardless of date. Another option is selecting from a group of dates ranging from 'in the last week' to 'in the last 2 years.' Click the down arrow in the menu selection box and highlight the date range desired. The third option is for the user to 'Specify a Range.' The user would click on this option and then enter the date range desired. The STAR System default is to sort the results of a search by relevance. The documents will be sorted by closest match according to the search criteria. Results may also be sorted by date. Once the necessary search criteria have been entered, the Search option is chosen. Examples of the search criteria screen and the resulting documents located follow. Select the document to be viewed. Anyone who can access STAR can print to a local printer. The entire documents can be printed by choosing the Print command under the File menu in Internet Explorer. The auditor should be careful in applying information found. The information may result from a specific set of conditions and may not be applicable in all circumstances. In addition, due to tax law changes and a four year statute period, the document reviewed may apply to only a portion of the audit period. Several booklets, brochures, and other publications have been prepared by the Comptroller's Department on various taxability areas. The auditor should ensure that the publications used are current with the latest tax law. Check the Index to Comptroller Publications which is updated quarterly. If the research has not provided the answer to a taxability issue, the auditor should then discuss the issue with the group supervisor. The auditor and the supervisor may need to consult the field office manager for the answer. If the auditor does not get an answer from these discussions, the group supervisor/manager, or the auditor with the supervisor's permission, should call Audit HQ for guidance. 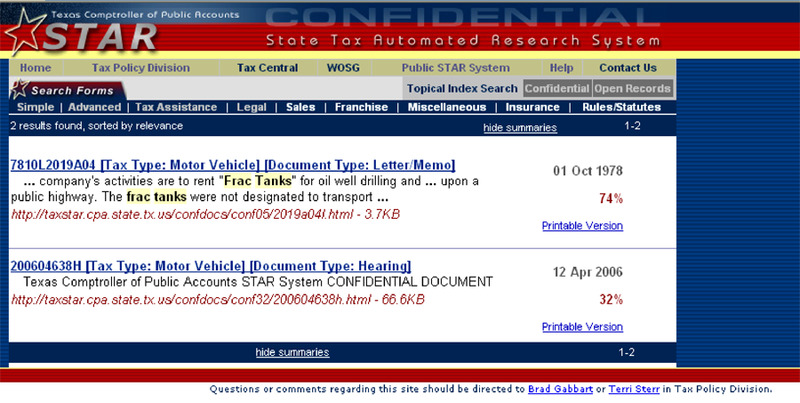 If the taxability issue is still unresolved after researching the STAR System, after discussing the issue with the group supervisor, and after contacting Audit HQ, the group supervisor or audit manager may submit a Taxability Response, via e-mail, to Bryant Lomax in Tax Policy with a cc to David Rock or Emma Fuentes, both in Audit HQ. Both the auditor's and the taxpayer's fact situations are presented in this Taxability Response. Therefore, the auditor must have the taxpayer's representative's input in presenting the fact situations for this Taxability Response and, if possible, all parties must agree to the fact situation presented. The auditor will only request an answer from Audit HQ and Tax Policy after all of the aforementioned efforts to resolve a taxability issue have been exhausted. This is not a pre-audit function. This is to be done after the auditor thoroughly understands the taxpayer's situation, has researched it and still cannot resolve it. Depending on the size, complexity, etc., of the account to be audited, sources of information such as the following may be considered prior to beginning field work (they are available in the office library). They can be used to identify outlet locations and the types of services provided by the taxpayer as well as phone numbers. Can be used to trace hard to contact taxpayers where the address is known, but phone number or name is unknown, or a phone number is known but an address or name is unknown. Lists parent corporations, their divisions, subsidiaries and even plant locations. This gives a quick view of the corporate structure, interests, types of business activity (via NAICS codes SIC codes), sales volumes, contact names and phone numbers. In addition, Security and Exchange Commission 10K Reports are available at some libraries or through Audit Headquarters. These annual reports, if available, can be obtained from the taxpayer. Occasionally, the audit file will include magazine or newspaper articles about the taxpayer's business. These should be read in their entirety for items of interest. Identify himself/herself and the purpose of the call. Discuss the tax or taxes to be audited. Establish an appointment for the entrance conference. Establish a starting date for the audit. Verify the taxpayer's location and get directions. Tell the taxpayer what records may be required and that additional records may be necessary as the audit proceeds. Determine the location of the records. If the records are outside of the audit office assignment area, then a transfer of the audit should be considered. Inquire about available working space. If records are removed from taxpayer premises, complete Receipt for Taxpayer Records. See Chapter 9. If possible, determine the taxpayer's understanding and interpretation of the law and rules with emphasis on recent law changes. Observe the rules of professional conduct. Complete a list of questions to ask the taxpayer during pre-audit research to make the initial contact more professional and efficient for both the auditor and the taxpayer. Discuss business description, activities and organization's structure. Discuss the different tax types for which the taxpayer is responsible. Determine the taxpayer's accounting system and reporting procedures. Are records computerized or manual? Determine the method of accounting (Cash or Accrual). Discuss the volume of records needed for the audit period. Are the records needed for the audit period easily accessible? Are all records necessary for the audit available? If not, why not? How are the records filed? Discuss the volume of records to determine if a sample/projection would be feasible. Discuss the volume of resale/exemption certificates. How are they filed? Determine if a sample or a detail audit would be feasible. If the records are too voluminous, discuss sampling methods. Determine how bad debts are handled. Determine how credit memos are handled. What is included in deductions? Reasonable requests by a taxpayer to delay the audit should be granted up to a point. Requests from the taxpayer for lengthy delays should be submitted in writing. The auditor should set a firm date to begin the audit after granting an initial delay. All delays or cancellations to begin the audit should be documented in both Agency Work Manager and in the audit plan. After granting an initial delay and after setting a firm date to begin the audit, the auditor should determine whether an Agreement to Extend Period of Limitation should be completed. See Chapter 4, Exhibit I. NOTE: The auditor needs to stress to the taxpayer that the list of requested records is only preliminary and that more records may be requested once the actual field work begins. After the preliminary arrangements have been made, the auditor should be ready for the entrance conference. NOTE: After this initial telephone contact, if an appointment to begin the audit is not set within 45 days, a written follow up is required every 45 days thereafter until an appointment is finally set.